A nonlinear Schrödinger equation (NSE) describing packets of weakly nonlinear waves in an inhomogeneously vortical infinitely deep fluid has been derived. The vorticity is assumed to be an arbitrary function of Lagrangian coordinates and quadratic in the small parameter proportional to the wave steepness. 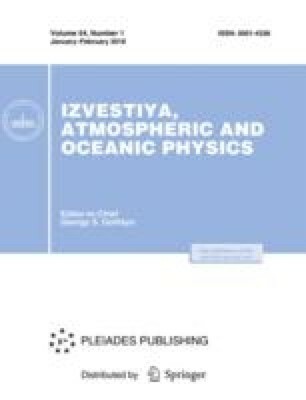 It is shown that the modulational instability criteria for the weakly vortical waves and potential Stokes waves on deep water coincide. The effect of vorticity manifests itself in a shift of the wavenumber of high-frequency filling. A special case of Gerstner waves with a zero coefficient at the nonlinear term in the NSE is noted. Original Russian Text © A.A. Abrashkin, E.N. Pelinovsky, 2018, published in Izvestiya Rossiiskoi Akademii Nauk, Fizika Atmosfery i Okeana, 2018, Vol. 54, No. 1, pp. 112–117.